So, I like Minecraft. You might has guessed as much after my DIY Creeper Peeps and Minecraft World Building Marshmallows. 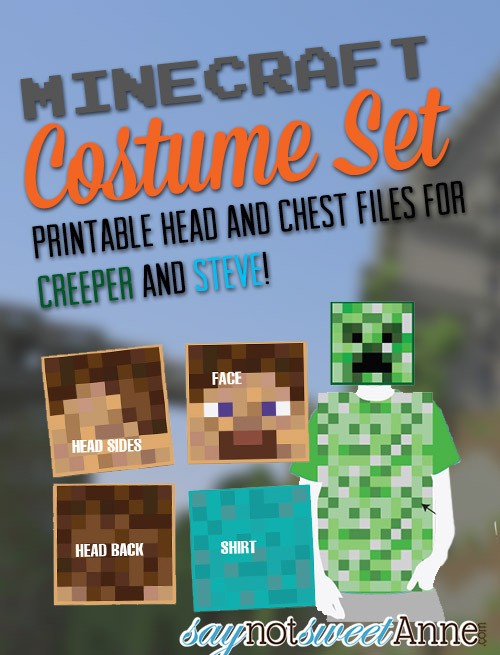 So it may not come as a surprise to you that one of our ideas for Halloween this year is to dress up like Steve (the player character) and a Creeper! So, I set to work making the printables we would need. The printable heads are meant to be printed large and then spray-glued to a square box that will go on the head. For Steve, all you need beyond that is a blue shirt and jeans! The Creeper could get a little more in depth, but we’re planning on a green tshirt and pants under a chest sized box to complete the ensemble. Steve was the hardest, as his face has 5 visible sides. I studied the in-game graphics and then created these in Illustrator in a HUGE size. That way those pixelly squares are crisp and clean and… well… not pixelly. 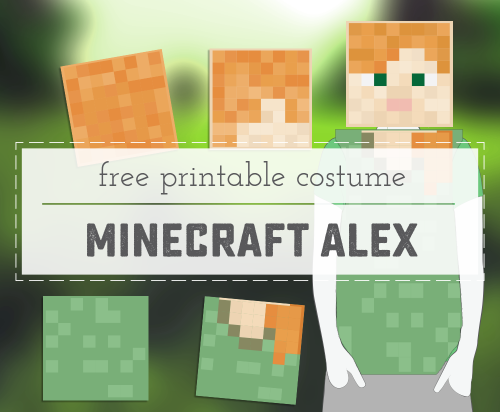 Now there’s a Minecraft Alex Printable TOO! A box the size of your head that you can fit comfortably in. A rectangular box that your body will fit in (optional). Spray adhesive (my fave) or rubber cement. Grab a square box that fits you or your child’s head. Print the base file, and apply it to all but the front side of the box. Print the face file and apply it to the front of the box. Cut out eye holes (choose one of the squares if you want it to be covert) and Voila! 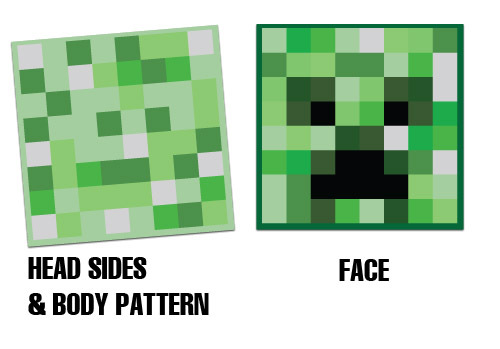 A creeper head costume! Wear all green and you are good to go. Perfect for the game-minded person in your life! Additionally, if you want to be a little more authentic, use a rectangular box as a chest. 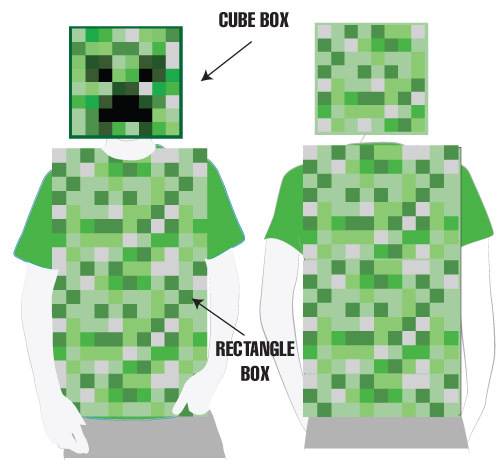 I’ve included a texture to print and paste onto the chest box to mimic the Creeper’s chest. That’s going all out! Start again with the box. Print all the sides of Steve’s head, and apply them to the box accordingly. Cut out eyeholes and a neck hole for the wearer. Steve is just a boy in a shirt and jeans, so you can definitely stop there. But, I’ve included a chest pattern for Steve too – so you could grab another box and go to town! Use: Right click > “Save As…” to save files to your computer and print later! Thanks for sharing this! My 7 year old wants to be a creeper for halloween and this will totally help me out! Its great! you may have just saved my sanity! We’ve been looking all over for printable minecraft costumes!! Thank you thank you!! Krista! I’m so glad you like it! Thanks for the posting the printable Steve head. When I printed it out, the printed size is about 7 1/2 inches x 7 3/4 inches. Is that the correct size? Or, is it supposed to print out larger? The actual PDF file is about 17in x 17in. So if it is printing that small for you, it is likely because your printer or PDF reader is shrinking it. If you are trying to print in on 8.5 x 11in paper, your printer might have .5in margins, accounting for the lost 1 inch. So, how did you print it to be that large (The 17 inch x 17 inch size)? I don’t need it to be that large (It’s for our 5 year old son). But, I think the 7 1/2 inch size will be too small. What size would you recommend printing it at? First I would recommend finding the box you will use for your Son’s head. Sounds like 10.5×10.5 might work? Some home printers are able to print on 11 x 17 paper, which would allow you to make a 10.5in square. Also, some printers can “tile” an image, where they print part of it on one page, and part on another, allowing you the piece them together. The setting for this would be different for every printer and printing program. If you don’t have this ability, Staples, Kinkos, and other shops will definitely be able to, usually for around $.50 a sheet. That means for the 5 sides of the head box, you’d be looking at about $3. For people going BIG who need the full size, a copy shop with poster prints would definitely be the way to go! So sorry for the very late reply. I was busy trying to figure out the box size & forgot to check for your reply. Anyway, got the box size to work. It might be a little small (Short) for our 5 year old, but it’s okay. It still works out. Thanks for all the info. Appreciate all of your help. Have a wonderful Halloween & fun-filled holiday season! Thank you for the pattern, I had been looking for the body part of the creeper for my son’s comic con costume. Thank you again.. Thank you soooo much! Last minute save on a school night! This is perfect thank you. My son needs a dress up for a school parade, and I have the most hectic week coming up, so I needed something fast and awesome. This ticks both boxes! I’m so glad it works for you Heather! 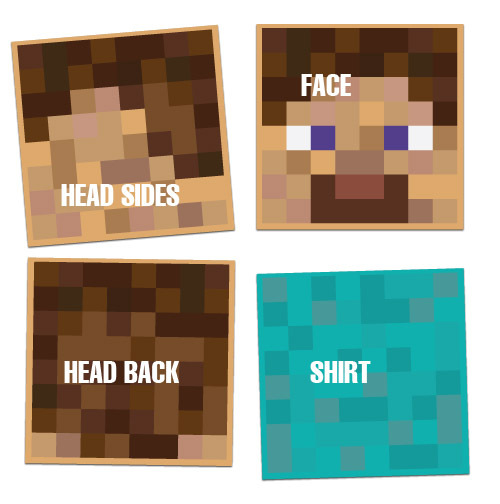 Wish you had a Minecraft Alex printable–my daughter wants to be that for Halloween this year and we are having a hard time finding. HI! 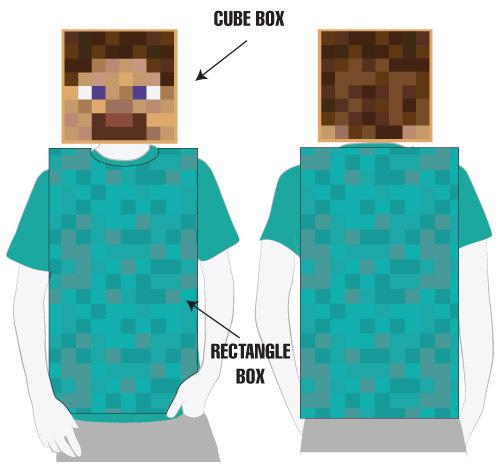 im trying to make a steve shirt for my 7 year old using the steve printout and a box. what size paper should i use at kinkos so that i can cover the box? poster size? The printable is designed so that you can cut it out and “tile” it (laying each copy slightly over the next to make a finished piece) so I’d recommend maybe 11x17in paper, but print several sheets and then cut/glue them on to the box until it is covered. Hope that helps! Hi! I’ve done this steve head before a few years ago for my nephew, and now my son wants to be creeper head. I think on the steve head I did like a 14x14x14 box, and it left a little overlap on each side so everything went together good. This year I think Im gonna do maybe a 11x11x11 for my kiddo. What size should I print the file to make it overlaps each side? Im printing it at fedex so I dont have to ‘ piece ‘ them together. Thanks so much! Hey Mandy! I’m so glad you like the costume. Be sure to pin and share it! The files at 100% are 16inches square. So, if you want 11 inches that means a little under 70% should do. At a copy shop their tabloid/11×17 paper will be your best bet. My guess is they can “print to fit” on that paper and it’ll turn out perfect for your box! You’ll need 1 copy of the Creeper Face and 4-5 of the Creeper Base/Chest for the box alone. Hope that helps! Aww, I’m so glad to hear it! Thank you so much! Tomorrow is storybook character day and my son wants to be Steve. Thanks so much! Totally saving my backside with decorations for a birthday party!! was totally stressing out until I found this! Thank you so much! Book character dress up day has been a breeze compared to previous years!! I’m so glad you liked it Lorraine! Thank you sooooooooooooo much!!! My boys will be so excited for this and you saved me $40/per costume 🙌 Or hours or painting or cutting out green and black squares!! I’m SO GLAD Lisa! Honestly, it is a GREAT costume for very minimal effort. A total parenting win in my book! hi there trying to make my son a last minute halloween costume. there isnt a link for the steve printable. unless im missing it completely? You’ll find the links to several files right underneath that. Good luck! thank you for posting this minecraft costume. My son’s 7th birthday theme is minecraft he love so much minecraft. This is a big help! Can I ask also if you have some printables minecraft birthday themes.